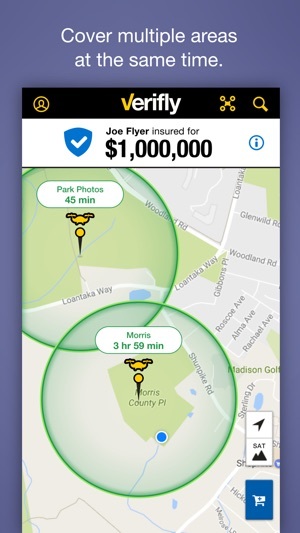 Verifly is THE source for on-demand drone insurance. Whether it's a recreational or commercial flight, it's covered in a few taps. Your policy lets you fly up to 2 miles around you for as long as 8 hours. 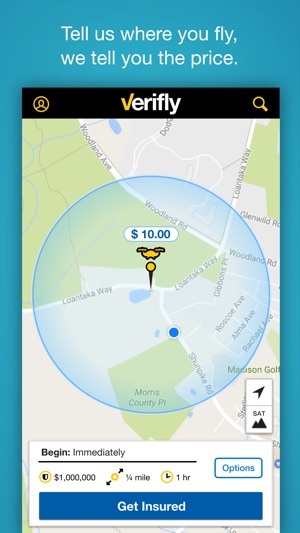 Couldn't be easier or faster: use the map to pick your launch point and get your price instantly. Then give us your name & debit/credit card info and you'll get your proof of insurance via the app and email INSTANTLY. Why fly at risk? Works with any drone up to 35 lbs. Supported drones include the DJI Spark, DJI Mavic, DJI Mavic Air, DJI Matrice, DJI S-1000, DJI Phantom, DJI Inspire, 3DR Solo, Yuneec Typhoon, Yuneec Tornado, Parrot BeBop, Parrot ARDrone, senseFly eBee, senseFly albris, and many many more. No connection to the drone is required. - Up to $10M in liability insurance. Covers your legal liability for injury to people and property damage. Insurance policies arranged through Verifly are underwritten by Global Aerospace, Inc., a leading provider of aviation insurance for over 90 years. 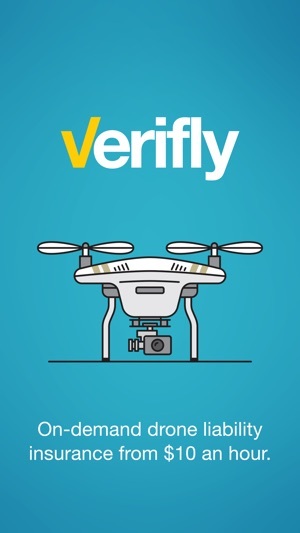 Verifly is available in all states except ND. Working hard to cover this state soon. Stay tuned. Don't fly at risk. Don't lose out on jobs that need you to have insurance. Especially when Verifly makes it all so easy! We'd love to hear your feedback, questions or suggestions for our app! Email us at ios-help@verifly.com. Please note: policy details and terms and conditions are available within the app. Verifly delivers drone liability insurance, and as such the policies we arrange do not insure the drone itself. Verifly Insurance Services, Inc. is a licensed insurance broker. This service is amazingly easy to use, and the brilliance of it is the fact that you only pay for the coverage you choose, at the location you use, within the timeframe you choose. 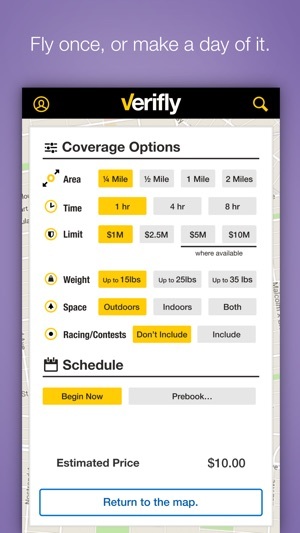 Comes up right away showing where you are on the map, and you can immediately purchase coverage for that location... or purchase ahead of time by moving the map to where you want it. 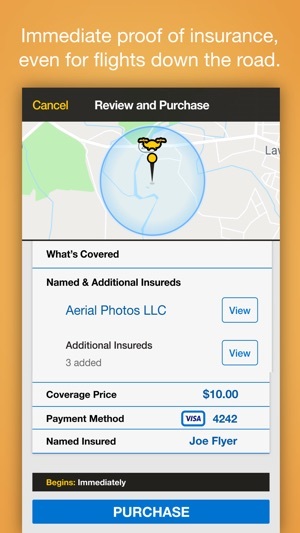 With coverage this affordable and accessible in real time, there is no longer ANY reason not to purchase per-flight insurance for high profile drone flights. I had a fantastic experience working with Verifly. I was doing drone work in Griffith Park in Los Angeles, which meant working with Film LA and the Parks & Rec Department. Jay was incredibly responsive and helped me understand exactly what I needed to present to Film LA for my drone insurance. Permits like that get rejected all the time and he helped me make sure mine wasn't rejected. I was particularly grateful because we were under a very tight schedule and Verifly moved things along incredibly quickly. I highly recommend Verifly. As a professional photographer I shoot a lot of multi million dollar listings and obvious concerns are always personal property and any damage caused while on site using the drone. I did my research and this is not some fly-by-night Start up, legitimate and a long history in aviation insurance and I assume my research is correct. I don’t think you could’ve made that process any easier and now that has become part of my checklist of offerings. Thanks again.